I’ve known Roachside Cottage for as long as I can remember. It was always “that place I'd love to live”, right back to the days when I came here on my Dad’s shoulders in the 1950s. Its remote position and commanding outlook always captured the “wilderness man” in me. When we bought it this summer, it was a dream come true – despite the fact that I can’t actually live in it because of its designation as a “short-term rental property”. Since we’ve been up here doing a few little jobs to get the place in order, we’ve been gathering various bits of historical data from passers-by, neighbours and even the local expert on Peak District vernacular architecture, Faith Cleverdon. As part of this quest to delve into the history of this cottage of ours, I posted a request on the Facebook page of “Roaches Appreciation Society”. Within hours, I’d had a couple of dozen responses (every one from someone who, I’m sure, would also love to live here too!) with information about former residents, names of contacts I might pursue, offers to include the cottage as a subject in a sunrise photoshoot and a truly fabulous painting by Stephen Crofts completed in the mid 1990s. My thanks to Stephen for permitting me to use this image here. As documented on these pages previously, our old central heating boiler has died and had to be replaced. Now most people equate the words “central heating boiler” with that white shiny box on the wall in the kitchen. Not so the boiler at Roachside. The walls of the kitchen are just too thick and uneven to fit a boiler to. Our oil-fired boiler is a great industrial beast of a thing which lives in the back yard, breathing intermittent clouds of water vapour from its snout. Hence, replacing this beast in winter, in the shadow of the back yard, 1100 feet above sea level is no mean feat. It requires coordinating two fitters and the Northern Maritime Climate over a window of two days. The two days in question were dry enough, but they were the two coldest days of 2017 thus far! A job for a couple of tough young fitters eager to build their reputation, you may think. Well, you may be surprised to learn that the bulk of the work was carried out by my friend and fellow Mow Cop villager, Horace Hoskins – aged 80 years! Of course Horace didn’t maul 150kg of old boiler out and lump 150kg of new boiler in unaided. He had grandson Jordan to help. But he did spend two days piping up, wiring & commissioning on his knees, back bent to the freezing wind whistling through the yard. Horace spent several hours over the last few weeks kneeling on the cold concrete, poking and prodding and twiddling and fiddling, coaxing the old boiler though its death throws. This is what he does day in, day out. As his knees and finger joints creak and groan with 8 decades of wear and tear, he can still demonstrate a fine example to the younger generations who are following him! You just can’t keep a good bloke down. The boiler has died. After 9 visits from two experts, it still locks-out and it now makes a menacing booming/throbbing sound when reset. The manufacturer’s helpline were as baffled as the experts on site. It’s time to replace this beast. While we wait for the shiny new replacement, we are having to depend on the two small auxiliary panel heaters and, on very cold nights, the log burner. Now log burners are very trendy. I love ours. They look nice, with their lazy orange-yellow flames casting a warm glow across the room. They are "cosy cottage" writ large. They even put out a fair bit of actual heat. But, Lord, do they eat fuel? A few nights ago, the forecast was for a heavy frost – maybe as low as -4°C. Having exhausted the bags of logs brought from my garden, in the early evening I took a trip down to Asda, where I’d seen logs on sale at £3.50 a bag. Four of these bags fit comfortably into a shopping trolley. By midnight, we’d burned through £14 worth! I have to say, underfloor central heating wins “hands down” every time! 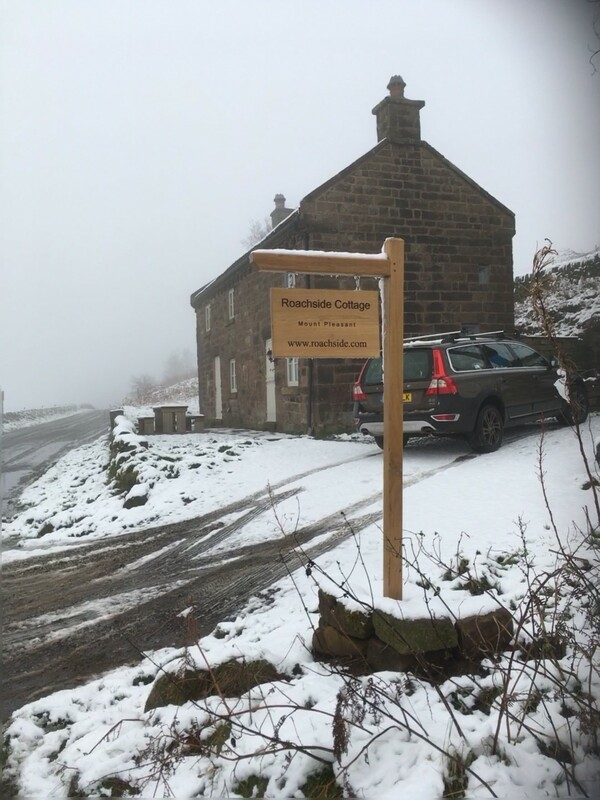 We woke up to the first snow of the winter this morning – we weren’t at Roachside, we were at home in Mow Cop, which is at exactly the same elevation. There was a couple of inches of the white stuff piled on the car – a bit less on the ground. With the oil boiler still being out of action and the electric panel heaters going full-tilt at the cottage, we took a quick trip over to The Roaches to check that all was well. There were a good number of cars parked along the lane – people obviously getting out for their first winter outing. We need not have worried, the trusty little heaters had kept the place at a comfortable 21°C downstairs, which is perfectly adequate for the dozens of hibernating ladybirds clumped together behind the curtain bracket in the kitchen (where they can't be reached). Having driven there, it was too much of a temptation to have a wander along the Five Clouds and up onto the top. Thick, low-lying cloud had enveloped the whole crag while we were booting-up and the gloom persisted over the top. As we came back down from the trig point past Doxey Pool, ghostly figures appeared in front of us; four young chaps rolling a giant snowball. They heaved and heaved the thing over the heather and it grew and grew. It was clearly generating much hilarity with them as they heaved and slithered down the slope. As we lost sight of them, it must have been at least a metre and a half in diameter. I guess if you pass this way in the spring, it’s leftovers will probably be lurking on the moor and visitors will wonder from whence it came. Friday evening, our good friend Jane invited us to join her at the Christmas Street Fair and the switching on of the town light display in Leek. This is quite an event. Even Father Christmas puts in an appearance, as do some of his reindeer! We put on some vaguely respectable jeans & combed our collective hair and set off to join the throng. Near the Monument, a lorry-mounted stage had gathered a large audience for “ThunderHammer”(?) – the leaping and gyrations of the singers was unquestionably athletic and well synchronised, but the sound system overwhelmed my hearing devices, so I can’t comment on the musical aspect of the performance. The main streets of the town centre were lined with all manner of market-type stalls, some commercial and some displaying the work of dozens of charitable and voluntary organisations. Hoards of people wandered about looking at displays & engaging in conversation. We enjoyed an excellent Bangladeshi Chicken curry from the streetfood stall run by one group who support refugees. Scout wolfed down a couple of large pieces of someone’s pizza that they’d dropped. Further on, the ladies from the Foxlowe Arts Centre were plying their trade in Mulled Wine. Now, as an affirmed beer drinker, I’ve never mastered the taste of wine. It’s for cooking with really. Coq au vin or Mussels in red wine, boeuf bourguignon – that sort of thing is what wine is good for. So I reckon that warming up red wine in a pan and chucking in some herbs and spices and a chunk or two of apple is about as good as you can make it. You know what? It was really quite nice. We finished off with a very civilised drink of proper beer in recently re-opened Quiet Woman. Good beer, lovely surroundings and excellent company. What better way to kick-off the festive season?